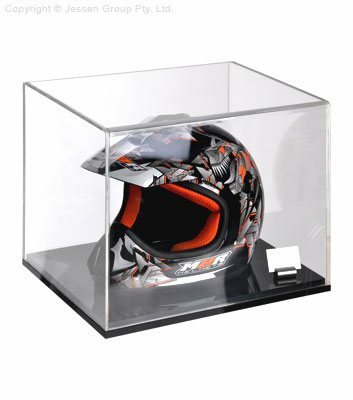 This clear acrylic display box, like a plastic cabinet, helps you to display collectibles, trophies, memorabilia, or even merchandise such as glassware, jewelry or small electronics! The 6mm thick clear acrylic case offers a full view of displayed items whilst preventing grime or dust from gathering on items. This clear acrylic also has a UV protective coating which helps to prevent fading from harmful rays over time. Polished edges and a slight curve atop the case finish off the professional look of this case. The clear acrylic display box is a medium size case, measuring in at 382 x 282 x 282mm inside to provide heaps of space for displaying items. The rectangular showcase has a high gloss, black acrylic base that is 20mm thick to be a solid holder for your items. Using a high gloss base offers a slight reflection of displayed items to really add a stylish flare. The acrylic top has a lift-off design, which fits around the base snugly. The display is designed for table or countertop use, measuring in at 369 x 385 x 369mm in total size. If using a round item such as a footy or rugby ball, there is a circular riser included to help prevent the ball from rolling around. This riser is made from 5mm thick clear acrylic with a 60mm diametre, which will be barely visible thanks to the reflection of the base. Whether used at home, within a retail store, or at a special event, this clear plastic display makes a great purchase at an affordable price. Orders made by 2pm EST will despatch same day to anywhere in Australia when in stock, only from Slimline Warehouse!